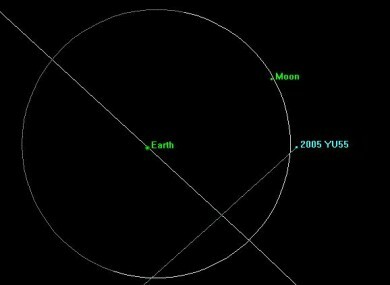 NASA's chart of asteroid 2005 YU55's trajectory. A GIANT ASTEROID is to pass within the moon’s orbit of the Earth later today. Astronomers say that the 400-metre-wide object called asteroid 2005 YU55 is expected to pass safely and can be viewed from Ireland just before midnight tonight. Astronomy Ireland has uploaded a map of the night sky for people to spot the asteroid’s path, but you’ll need a telescope as it won’t be visible to the naked eye. Although passing relatively close (in comparison with other celestial objects), this asteroid poses no danger to the Earth. But what would happen if an asteroid of this size hit us? David Moore of Astronomy Ireland says this asteroid is about the same size as an aircraft carrier, but is travelling at ten times the speed of a rifle bullet. And that could do a lot of damage. “If a bullet that size hit the Earth, it would cause a major explosion from the impact. It would be the equivalent of 7,000 atomic bombs falling of the same size dropped in the Second World War,” according to Moore. It would also throw up so much dust into the atmosphere it could induce a ‘nuclear winter’ cause serious problems for the environment and climate. Scientists have calculated that an asteroid of twice this size (ie 1km across) would kill a quarter of the world’s population almost instantly, and with the resulting disease and destruction “it would knock us back to the Stone Age”, he says. So… how worried should we get? Moore says astronomers around the world have been carrying out a survey of asteroids. Asteroids orbit the Sun in regular patterns that can be charted, and so far around 90 per cent of th0se larger than 1km width have been mapped “and don’t have our name on them”. Comets, on the other hand, are much more difficult to predict. An object of a devastating size hits the Earth every few hundred thousand years and is as likely to strike during your lifetime as during your great-great-great-great-grandchild’s. One hit an uninhabited area of Siberia in 1908 destroying several hundred square miles of forest. “Had that happened over a major population centre like London, it would have killed millions of people. It was just random chance that it hit Siberia and not somewhere else,” Moore said. Although there’s no danger from the asteroid passing the Earth today, it serves as a reminder “that we do live in a shooting gallery”. On the plus side, only a very small portion of the Earth’s surface is actually populated so the odds of an asteroid destroying your neighbourhood are decidedly on your side. Also, smaller asteroids are burned up in the atmosphere before they can reach the Earth’s surface. Could anything be done to prevent such destruction? A number of options are being considered, according to Dr Alan Shearer, head of NUIG’s Centre for Astronomy. One idea (à la Bruce Willis and co in Armageddon) is to nuke an approaching asteroid and break it into smithereens. Unlike the film though, Shearer warns the likelihood of blowing it up successfully is pretty low. One big problem with this theory, AI’s Moore warns, is that you don’t really know what’s going to happen to the pieces. So instead of a single ‘bullet’ hit, you end up with shotgun blast of multiple asteroid pieces. Alternatively, a rocket or explosive device could be attached to the asteroid in an attempt to knock it enough off-course that it will pass Earth safely. The earlier you could do this, the easier it would be, Shearer says, noting that a slight adjustment in the asteroid’s path earlier on will have a stronger effect on its route. Another option would be to direct solar energy towards the object to vaporise it or deflect it from its Earth-bound path. Shearer says this proposal involves attaching a tinfoil-like substance to one side of the object to draw in the sun’s heat and push it somewhat off-course. Shearer says that NASA’s recent success in landing a spacecraft on an asteroid in February 2011 was done primarily to show that it was possible, but also to study the asteroid itself. The capability to land on an asteroid shows that a number of options could be explored to steer an asteroid away from Earth. Either way, Shearer says he wouldn’t put any money down on one hitting us any time soon. Email “Asteroid comes close to Earth - but what would happen if it hit us?”. Feedback on “Asteroid comes close to Earth - but what would happen if it hit us?”.